These five precious orphaned kittens, had a tough start in life. 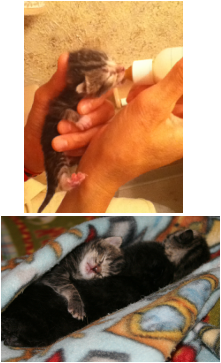 Their mother, Buttons, was rescued from the streets. She could not deliver her babies on her own. She was rushed to Sand Road Animal Hospital and underwent a cesarean section; it was the only hope for the babies. Sadly Buttons died due to complications from Feline Leukemia (FeLV) two days after giving birth. FeLV is an immune disease that is contagious between cats and in most cases shortens their life-span to just a couple of years. The kittens survived with the help of a very compassionate and expert team of vets and staff at Sand Road Animal Hospital. Then, they received around-the-clock care from our volunteers at the Better Days Rescue Fund (BDRF). Feedings began every two to three hours, twenty-four hours a day, for six weeks. We knew there was a chance the kittens could test positive for Feline Leukemia, since it can be passed on from the mother during pregnancy. Still, we took heart in the kittens’ strong will to live. 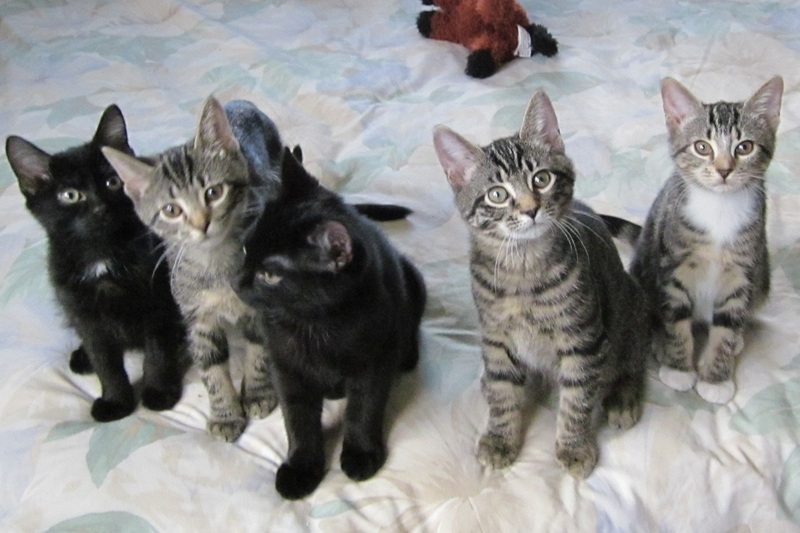 The kittens thrived and are very healthy, playful and affectionate. At 10 weeks old, they were tested for the disease. When the test results came back from Cornell University School of Veterinary Medicine, we were devastated to learn that all five were positive for Feline Leukemia. 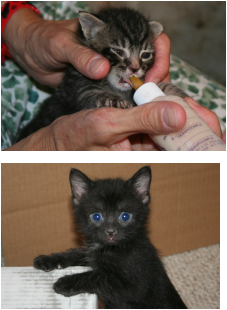 The kittens are healthy right now and they are having such a wonderful life. Because they do not show signs of the disease they are not sick and they do not need any medication. They feel great! With luck they may never get sick. They are loved and they play non-stop. But because they are contagious to other cats, we faced a tough decision. If we could not find a place for them to live their lives safely and with quality, they would have to be euthanized.We went to the internet and sent out a plea for help. Then a miracle happened. Two people, who would like to remain anonymous, contacted the rescue group. These people do what few people are willing to do -- they take in leukemia kittens. They've had many! They provide them with love and a cat nirvana for a home for as long as they are healthy. Complete with cat-walks through the house, cat perches, and a screened in porch with cat walks to get a bird’s eye view of the world, cats here play hard and are spoiled every minute. Their lives are full and happy. Because all of the kittens in the home have the disease, they are free to interact and enjoy each other’s company. This couple does not believe that leukemia should be an automatic death sentence. When their time comes they have had a full life, and they are held in the arms of this loving couple as they gently pass. These two heroes of the cat world agreed to take all 5 kittens and keep the family together. They do this invaluable service out of their own pocket. They are not an organization and don’t get funding or donations. Taking on these kittens is an incredibly selfless, compassionate thing to do, but also expensive.